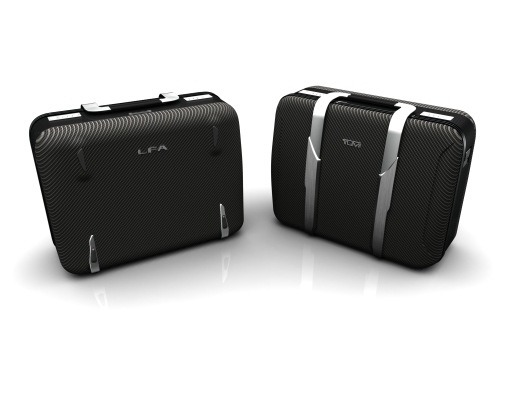 Tumi has announced a partnership with Lexus that will offer LFA customers a premium line of travel cases customized to compliment the 2012 Lexus LFA supercar. Lexus has admired the Tumi brand expertise in travel, business and lifestyle which was one of the reasons for partnering up with the brand. Like Lexus, Tumi has exceptional brand heritage in performance and function, and the highest level of excellence in design, said Jerome Griffith, president and chief executive officer for Tumi. We are excited about the partnership with Lexus because it will further communicate Tumi’s reputation for outstanding quality and craftsmanship. All of the custom travel cases were styled using components that directly reflect the appearance of the LFA and each piece will have the owner’s VIN number inscribed to complete the exclusive experience. Lexus will roll out the limited edition LFA Tumi luggage in select markets throughout the US and Europe. Production of the LFA is limited to 500 units worldwide, and deliveries are expected to begin in January 2011.